Original Editors - Michael Fogarty from Bellarmine University's Pathophysiology of Complex Patient Problems project. Giant cell tumors of the bone are benign multi-nucleated cell masses that are commonly found at the epiphyses and sometimes the metaphyses of long bones. These tumors get their name due to the large cell appearance they have when viewing them under a microscope. Giant cell tumors are a discrete and locally aggressive abnormal growth or tumor that can metastasize to other areas of the body. The metastatic forms of giant cell tumors are known as malignant sarcomas, though this form of giant cell tumor is very rare. Giant cell tumors of the bone are one of the most challenging benign bone tumors due to resulting substantial bone damage, local reoccurrence, lung metastasis, metastasis to lymph nodes, and malignant transformation. Giant cell tumors of the bone are rare and occur in roughly one out of every million people per year. In the united states 5% of all the primary bone tumors and 21% of all benign bone tumors present as a giant cell tumor. Significantly higher incidence rates are observed in the Chinese population as compared to the western Caucasian population where giant cell tumors constitute up to 20% of the population being affected. The most common incidence for giant cell tumors is in skeletally mature patients between the ages of 20 and 55, with the maximum occurrence in the third decade of life. Females are more likely to develop giant cell tumors than males with a 1.3-1.5: 1 ratio. These tumors most frequently involve the epiphyses ends of long bones with the femur, tibia, and distal radius most commonly involved.. The most common locations of occurrence are around the knee which is involved in 60% of cases, the distal radius which is involved in about 10-12% of cases, and the sacrum which ismore raree rare but still the third most common location of involvement. Though metastasis to the lungs does occur it is very rare and only about 3% of cases will result in the tumor spreading to the lungs. When giant cells metastasize to the lung they appear as clusters that are located within the lung. Giant cell tumors metastasize at a slow rate and usually do not appear for 3-5 years after the patient has been diagnosed with their primary bone tumor, but this metastasis may go unidentified for up to 10 years or longer. If significant bone destruction occurs at the tumor site and the cortex layer of the bone is damaged a pathological fracture may develop. If the tumor is in a weight bearing bone the patient may present with significant pain upon weight bearing. When the sacrum is involved the patient may present with localized pain in the low back and sacrum that may radiate down one or both legs. Swelling may also be present in the location of the tumor. The patient may also state that they are experiencing abdominal discomfort and may present with neurological problems such as bowel and bladder dysfunction, sexual dysfunction, and numbness/weakness of the lower extremities. No associated co-morbidities were found to be related to giant cell tumor. This medication is not used as a cure for the giant cell tumor itself but is used instead to inhibit the osteolytic development of bone that is seem at the location of a giant cell tumor, they act by inhibiting osteoclastic bone resorption. Research indicates that bisphosphonates may be beneficial in managing disease advancement in giant cell tumors of bone and these agents have been found to directly inhibit the giant cell tumor. Giant cell tumors are usually diagnosed by x-rays and verified through histological evaluation with results that are typically found with the specific characteristics of giant cell tumors. Below is a list of diagnostic tests that may be utilized to help identify and distinguish the type of tumor that is present. Biopsy of the Tumor: A sample of the tumor is removed and inspected under a microscope and allows the physician to determine the aggressiveness of the tumor. The cellular structure of the tumor is then examined to rule out other malignant tumors that may resemble a giant cell tumor. X-rays: X-rays are diagnostic tests that are used to produce projections of radiographic images of bone tissues and other organ tissues onto film. 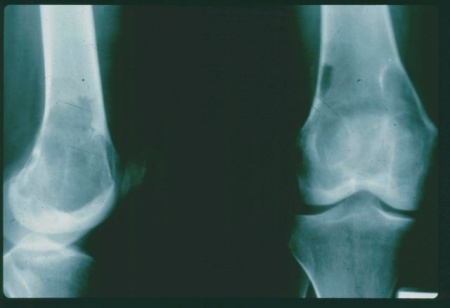 Giant cell tumors appear as translucent lesions within the bone that are usually near the joint line. 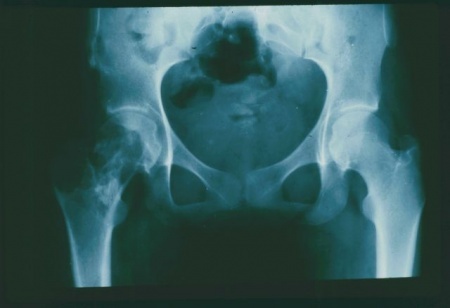 The section of the bone that is involved is surrounded by a slim border of white bone; the bone in the region of the tumor is occasionally protracted outward. Chest x-rays should be obtained at the diagnosis of the tumor as well as randomly during the follow-up to view for metastasis to the lung. MagneticResonance Imaging : MRI’s are diagnostic tests that use powerful magnetic fields to produce detailed images of internal structures within the body. This imaging procedure will allow for more in depth assessment of the bone that is affected. Computerized Tomography scan: A CT or CAT scan is a diagnostic imaging that uses a combination of computer processing and x-rays to generate cross sectional images of the body, they can also generate 3 dimensional images of the internal structure of the body. CT scans are more detailed than x-rays and can show imaging for bones, muscle, fat, and organs. CT scans are often performed in the lungs of patients with giant cell tumors to examine for signs of metastasis to the lung. Bone scan: Bone scans are used to help diagnose if a tumor is present and if it has spread to other areas of the body. A bone scan will show up with a “hot spot” in the location of the bone where the tumor is present. Complete blood count: Measures the size, number, and maturity of different blood cells in a precise quantity of blood. Giant cell tumors are believed to occur spontaneously with no known etiology. Though, “the tumor cells have been reported to produce chemoattractants that can attract osteoclasts and osteoclast precursors.” They have not been shown to be linked to factors such as trauma, environmental conditions, or diet though in rare cases they may be associated with hyperparathyroidism. Surgical removal has been shown to be the most successful treatment choice for the management of giant cell tumors. The most common form of surgery is called curettage in which the tumor is excavated out of the bone. After this method is performed there is an empty space in the bone that is filled with a bone graft either from other parts of the body or from a cadaver. This method of treatment has a high reoccurrence rate with the tumor returning to that same location up to 45% of the time when only the curettage and bone grafting are performed alone. Therefore, bone cement is also often used instead of the bone grafting and this method is shown to have a lower tumor return rate. “Enhancing the curettage with a high-speed burr or with the use of agents such as liquid nitrogen, hydrogen peroxide, or phenol, followed by placement of bone cement decreases the recurrence rate to 10% to 29%.” If the tumor has resulted in severe destruction or has reappeared in the bone then often more involved tumor removal as well all reconstruction is necessary. If a tumor is unapproachable or can only be partially removed then radiation therapy may be used as a treatment option, though it is never the primary treatment of choice. The use of radiation therapy is debated and only used for patients who are not surgical candidates since it has high recurrence rates and a connection has been linked between radiation therapy and malignant transformation of the giant cell tumors. Curettage: The most common surgical treatment in which the tumor is dug out of the bone using a device called a curette that has a scoop, loop, or ring at its end. Another tool known as a burr is sometimes used in addition to the curette to help remove the tumor. For this surgical intervention the physician will cut into the bone to generate an opening in which the entire tumor is revealed and then it is excised out of the bone. Cryotherapy: This can be used in addition to the curettage treatment. After the tumor is removed liquid nitrogen is placed into the void left behind by the tumor in order to freeze the area. A freeze and thawing cycle is repeated 1 to 2 times to help destroy any tumor cells that may still be remaining and prevent them from growing. This intervention has increased risks associated to it and can result in a fracture or nerve injury so it is usually not considered a main treatment option. Bone Grafting or Cement Packing: Often the hole left behind by the tumor is filled with bone from other parts of the body (autograft), from donor bone tissue (allograft), or bone cement using the same material used in total joint replacements. En bloc resection: This is a more aggressive tumor removal procedure in which surgical removal of the bone containing the tumor is performed. Often internal fixation with pins is necessary to provide a framework for stability to the bone. If considerable amounts of bone were removed then donor bone or metallic substitutes are used to reconstruct the bone tissue. After treatment is performed for giant cell tumor the patient should have several follow up visits with their physician for physical examinations as well as radiographs of the tumor site and lungs to make sure it did not reoccur or metastasize for at least 5 years. Though it is not uncommon for these tumors to reappear in general the treatment for giant cell tumors has been found to be successful and has a good lasting prognosis. Physical therapy management will play an important role in the overall wellbeing of the patient, but it does not have a direct effect on treating the giant cell tumor itself. The physical therapist may be the first person to relate the signs and symptoms the patient is experiencing to something over than musculoskeletal origin; by recognizing the red flags that may be associated with giant cell tumors the PT is able to refer the patient out so they get the appropriate diagnostic tests performed to diagnose the tumor. This is important so that the tumor can be detected early on and appropriate treatment measures can be taken to remove the tumor. Physical therapy will also be incorporated into the patients treatment protocol in order to manage any impairments, functional limitations, or disabilities that are present secondary to complications of the tumor. The objectives of physical therapy are to enhance the patients quality of life and allow for an independent lifestyle. Some of the major areas of treatment that physical therapy will focus on are pain reduction, improved mobility, and restoring previous levels of function. This will be achieved first by educating the patient about their condition, make them aware of what they should and should not be doing in relation to their condition and emphasize the importance of staying active. Physical therapy will also focus on improving cardiovascular fitness and endurance to prevent fatigue and exhaustion with daily activities. It is important to focus on maintaining flexibility through stretching and range of motion activities to allow for good mobility, decreased joint stiffness, and decreased pain. A combination of light strengthening exercises, coordination exercises, and balance activities should also be incorporated to allow the patient to complete daily tasks in a safe and efficient manner. Giant cell tumor sign/symptoms are usually minor in nature and often resemble that of musculoskeletal origin. Sacral tumors are usually not diagnosed early on in their developmental stages due to their similar features to that of low back pain or sciatica. It is not uncommon for physical therapists to receive referrals from physicians before the accurate diagnosis is determined. Therefore it is important for physical therapists to take thorough patient histories and be aware of any red flags that may appear during an evaluation that make you suspicious that the condition is not musculoskeletal in nature. ↑ 1.00 1.01 1.02 1.03 1.04 1.05 1.06 1.07 1.08 1.09 1.10 1.11 1.12 1.13 1.14 1.15 Children's Hospital boston. Giant Cell Tumor. http://www.childrenshospital.org/az/Site960/mainpageS960P0.html. Accessed March 05, 2011. ↑ 2.0 2.1 2.2 2.3 2.4 2.5 2.6 Goodman CC, Fuller KS. Pathology: Implications for the Physical Therapist. 3rd edition. St. Louis, Missouri: Saunders Elsevier; 2009. ↑ 3.0 3.1 3.2 3.3 3.4 3.5 3.6 Valerae LO. eMedicine from WebMD. Giant Cell Tumor. http://emedicine.medscape.com/article/1255364-overview. Updated April 02, 2009. Accessed March 05, 2011. ↑ EmpowHER. Giant cell tumor, what is this?. http://www.youtube.com/watch?v=GG0I0WZzcGg. Accessed on March 30, 2011. ↑ 5.0 5.1 5.2 5.3 5.4 5.5 5.6 5.7 5.8 The American Academy of Orthopaedic Surgeons. Giant Cell Tumor of Bone. http://orthoinfo.aaos.org/topic.cfm?topic=a00080. Updated June 2010. Accessed March 05, 2011. ↑ 6.0 6.1 6.2 6.3 Goodman CC and Snyder TK. Differential Diagnosis for Physical Therapists: Screening for Referral. 4th edition. St. Louis, Missouri: Saunders Elsevier, 2007. ↑ Cancer Treatment Center of America. Oncology Rehabilitation. http://www.cancercenter.com/complementary-alternative-medicine/physical-therapy.cfm. Updated October 26, 2010. Accessed March 05, 2011. ↑ Martin C, McCarthy EF. Giant cell tumor of the sacrum and spine: series of23 cases and the review of the literature. The Iowa Orthopaedic Journal 2010; 30: 69–75. ↑ Bertoni F, Present D, Enneking WF. Giant-cell tumor of bone with pulmonary metastases. The Journal of Bone and Joint Surgery 1985; 67(6): 890–900. ↑ Saikia KC, Bhuyan SK, Goswami S, Bora A. Rare site giant cell tumors: report of two cases on phalanges of the finger and review of literature. J Orthop Traumatol. 2009; 10(4): 193–197.